As the largest supplier of frozen confectionery in New Zealand, Tip Top is continually looking for ways to improve processes to boost efficiencies, particularly during the peak summer sales period when the factory produces around 120,000 to 150,000 litres of product per day. Powdered ingredients are a key part of the frozen confectionery manufacturing process. Previously, intermingling of dry powder and wet ingredients prior to the mixing process, along with inconsistency in the ingredients being added due to human error, led to quality problems and potential delays at times. The new process involved a separation of the dry and wet ingredient areas, with dry ingredients being elevated to a higher level, while wet ingredients were kept at a lower level. 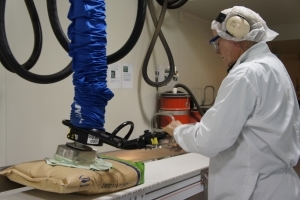 While principal contractor Powder Projects installed the overall solution, they turned to ControlVision to provide a vision system which would minimise the potential for human error in the dry ingredient adding process. 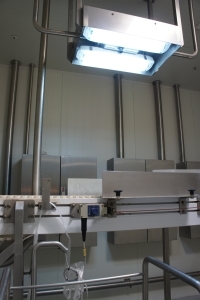 Tip Top had also already employed ControlVision to successfully install a machine vision system verifying lid placement on ice cream products, which helped cement the decision to utilise the machine vision integrator's expertise. 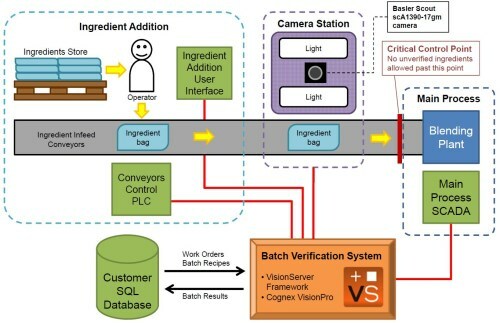 For the vision solution, ControlVision installed a Basler Scout scA1390-17gm camera above the dry ingredient conveyor. 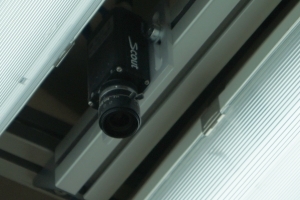 Images captured by the camera are analysed by VisionServer, which also provides the HMI for operators using the system. The ingredients are then checked against the recipe database within the system, and an alarm is sounded if an incorrect ingredient is added, and if too many or too few bags of a required ingredient is loaded on to the conveyor. Tip Top Project Manager Brett Dockery says since the new system has been installed, ingredient mixing accuracy has improved dramatically. "We have far less difficulty with the mixes being out of standard than we did previously. It's been remarkably successful, and the operators now swear by it as it helps them so much. Some of the mixes involve adding a total of 80 or 90 bags to the conveyor, which can only handle 15 bags at a time, so it's very easy to get things wrong, especially if the operator's attention is diverted during that time." Another challenge was that the system needed to accurately recognise a range of different artwork on the powder bags, particularly when certain products did not have ID or barcodes. As the supply of the components changed from time to time, the same ingredient could also be supplied in different bags. 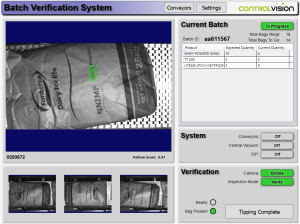 Thanks to the intuitive HMI provided by VisionServer, operators are able to quickly and easily train the system to learn any new bag artwork as required, and the camera has no problem recognising the different ingredients based on the bag artwork. Dockery says the traceability of the system has also led to benefits for the team. "Because the camera captures exactly what has gone into the mix, it is much easier to correct any mistakes than in the past, when we had difficulty in determining which ingredient was missing or wrongly added." The new system has also resulted in products of a more consistent quality. "As we have a much improved means of dispersing the powder into the wet ingredient fluid stream, we can make the most of all of the dry ingredients, as opposed to the past where there was significant residue." "In the end, we went to ControlVision because of their past experience, and what we knew they could deliver for us. It was a challenging project, and we realised right away it wasn't going to be easy, but now we have a system that is incredibly reliable." Powder Projects Director John Miles says ControlVision was the only company they considered for the Tip Top project. "The level of sophistication in the vision and automation that Tip Top requested required a very unique skill base which Dave and his team had in spades. I had no qualms that ControlVision would not deliver on the challenge." "From the project came a unique bespoke product tracking and batching system that reduced human factor risk, and greatly assisted the Tip Top production staff in improving quality assurance of every batch made. I would not hesitate to use ControlVision for any project that requires high level vision control."